Charles Francis Adams Sr. (August 18, 1807 – November 21, 1886) was an American historical editor, writer, politician, and diplomat. He was a son of President John Quincy Adams and grandson of President John Adams, about whom he wrote a major biography. Adams served two terms in the Massachusetts State Senate before running unsuccessfully as vice-presidential candidate for the Free Soil Party in the election of 1848 on a ticket with former President Martin Van Buren. During the Civil War, Adams served as the United States Minister to the United Kingdom under Abraham Lincoln, where he played a key role in keeping the British government neutral and not diplomatically recognizing the Confederacy. Adams became an overseer of Harvard University and built Adams National Historical Park, a library in Quincy, Massachusetts honoring his father. Adams was born in Boston on August 18, 1807. He was one of three sons and a daughter born to John Quincy Adams (1767–1848) and Louisa Catherine Johnson (1775–1852). His older brothers were George Washington Adams (1801–1829) and John Adams II (1803–1834). His sister, Louisa, was born in 1811 but died in 1812 while the family was in Russia. He attended Boston Latin School and Harvard College, where he graduated in 1825. He then studied law with Daniel Webster and practiced in Boston. He wrote numerous reviews of works about American and British history for the North American Review. Charles and his brothers, John and George, were all rivals for the same woman, their cousin Mary Catherine Hellen, who lived with the Adams family after the death of her parents. In 1828, his brother John married Mary Hellen in a ceremony at the White House, and both Charles and George declined to attend. Adams lived on Mount Vernon Street, Beacon Hill, Boston, 1842–1886. In 1840, Adams was elected to three one-year terms in the Massachusetts House of Representatives and he served in the Massachusetts Senate from 1843 to 1845. In 1846, he purchased and became editor of the Boston Whig newspaper. In 1848, he was the unsuccessful nominee of the Free Soil Party for Vice President of the United States, running on a ticket with former president Martin Van Buren as the presidential nominee. From the 1840s, Adams became one of the finest historical editors of his era. He developed his expertise in part because of the example of his father, who in 1829 had turned from politics (after his defeated bid for a second presidential term in 1828) to history and biography. The senior Adams began a life of his father, John Adams, but wrote only a few chapters before resuming his political career in 1830 with his election to the U.S. House of Representatives. The younger Adams, fresh from his edition of the letters of his grandmother Abigail Adams, took up the project that his father had left uncompleted and between 1850 and 1856, turned out not just the two volumes of the biography but eight further volumes presenting editions of John Adams's Diary and Autobiography, his major political writings, and a selection of letters and speeches. The edition, titled The Works of John Adams, Esq., Second President of the United States, was the only edition of John Adams's writings until the family donated the cache of Adams papers to the Massachusetts Historical Society in 1854 and authorized the creation of the Adams Papers project; the modern project had published accurate scholarly editions of John Adams's diary and autobiography, several volumes of Adams family correspondence, two volumes on the portraits of John and Abigail Adams and John Quincy and Louisa Catherine Adams, and the early years of the diary of Charles Francis Adams, who published a revised edition of the biography in 1871. He was elected a Fellow of the American Academy of Arts and Sciences in 1857. As a Republican, Adams was elected to the United States House of Representatives in 1858, where he chaired the Committee on Manufactures. 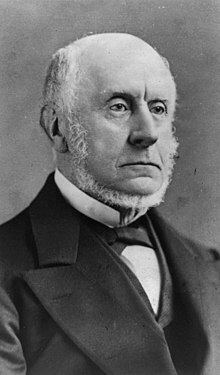 He was re-elected in 1860, but resigned to become U.S. minister (ambassador) to the Court of St James's (Britain), a post previously held by his father and grandfather, from 1861 to 1868. Powerful Massachusetts Senator Charles Sumner had wanted the position and became alienated from Adams. Britain had already recognized Confederate belligerency, but Adams was instrumental in maintaining British neutrality and preventing British diplomatic recognition of the Confederacy during the American Civil War. Part of his duties included correspondence with British civilians including Karl Marx and the International Workingmen's Association. Adams and his son, Henry Adams, who acted as his private secretary, also were kept busy monitoring Confederate diplomatic intrigues and the construction of rebel commerce raiders by British shipyards (like the hull N°290, launched as Enrica from Liverpool but which was soon transformed near the Azores Islands into sloop-of-war CSS Alabama). Back in Boston, Adams declined the presidency of Harvard University but became one of its overseers in 1869. In 1870 he built the first presidential library in the United States to honor his father John Quincy Adams. The Stone Library includes over 14,000 books written in twelve languages. The library is located on the property of the "Old House" (also known as "Peacefield") at Adams National Historical Park in Quincy, Massachusetts. Adams served as U.S. arbiter on the 1871–72 international commission to settle the "Alabama" claims that met in Geneva. He is considered one of the main contributors on this seminal work in forwarding the concept of world law through arbitration. In 1876 Adams ran for Governor of the Commonwealth of Massachusetts. During the 1876 electoral college controversy, Adams sided with Democrat Samuel J. Tilden over Republican Rutherford B. Hayes for the presidency. Adams died in Boston on November 21, 1886, and was interred in Mount Wollaston Cemetery, Quincy. He was the last surviving child of John Quincy Adams. His wife Abigail's "health and spirits" worsened after her husband's death, and she died at Peacefield on June 6, 1889. ^ a b "Book of Members, 1780–2010: Chapter A" (PDF). American Academy of Arts and Sciences. Retrieved 1 April 2011. ^ "Address of the International Working Men's Association to Abraham Lincoln, President of the United States of America". marxists.org. January 28, 1865. Retrieved October 22, 2013. ^ See Thomas Nast's satirical cartoon of Charles Adams' campaign at . An explanation can be found in American Heritage Magazine, August 1958 Volume IX Number 5 p. 90. ^ "Charles Francis Adams. The Aged Statement Gone To His Rest. Passing Quietly Away Surrounded By His Family". The New York Times. November 21, 1886. Retrieved 2008-06-17. Charles Francis Adams died at 1:57 o'clock this morning, at his residence, No. 57 Mount Vernon-street, in this city. He had not been well for some time and had suffered more or less for the past five years from some brain trouble, the result of overwork. ^ MacLean, Maggie, "Abigail Brooks Adams", womenhistoryblog.com, August 18, 2015. Retrieved 2017-02-08. Butterfield, L. H. et al., eds., The Adams Papers (1961– ). Multivolume letterpress edition of all letters to and from major members of the Adams family, plus their diaries; still incomplete. Donald, Aida Dipace and Donald, David Herbert, eds., Diary of Charles Francis Adams (2 vols.). Harvard University Press, 1964. Wikiquote has quotations related to: Charles Francis Adams Sr.
Wikimedia Commons has media related to Charles Francis Adams, Sr..
United States Congress. "Charles Francis Adams Sr. (id: A0000321859)". Biographical Directory of the United States Congress. Retrieved 2009-03-31. "Charles Francis Adams Sr". Find a Grave. Retrieved 2009-03-31.